Every Oregonian can get insurance, even if they have a pre-existing condition. 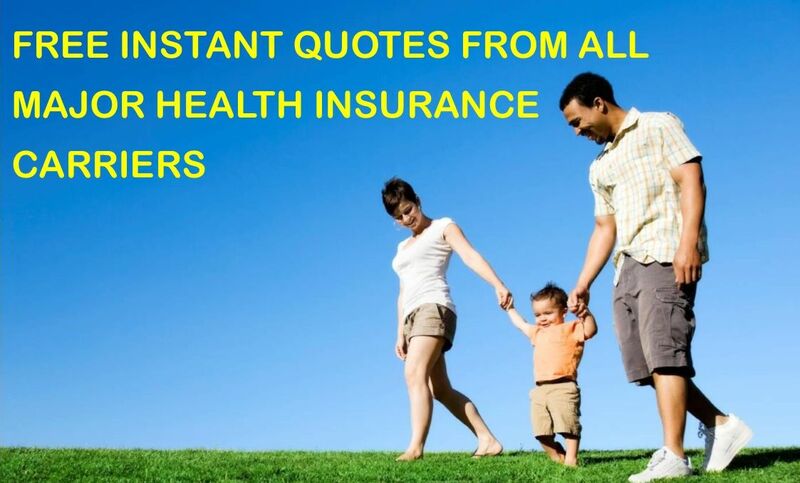 Most people must have health insurance. Financial help will be available to those who need it through Cover Oregon, the health insurance exchange. There are new lower caps on deductibles. All plans will cover preventive care, doctor visits, hospital stays, maternity care, emergency room care, prescriptions as well as dental and vision for children. If you choose to offer coverage, you may be eligible for tax credits through Cover Oregon. You have new options for purchasing insurance through Cover Oregon. The federal health care overhaul requires everyone to get insurance next year. People who don’t already have it will use Oregon’s new exchange – Cover Oregon. About 14 insurers submitted rates for individual plans on the exchange. Now, the Oregon Insurance Division has reviewed those plans and lowered premiums — from just a few percentage points to 30 percent. Savage says price differences are expected to level off as insurance companies gather more information on Oregon’s uninsured. 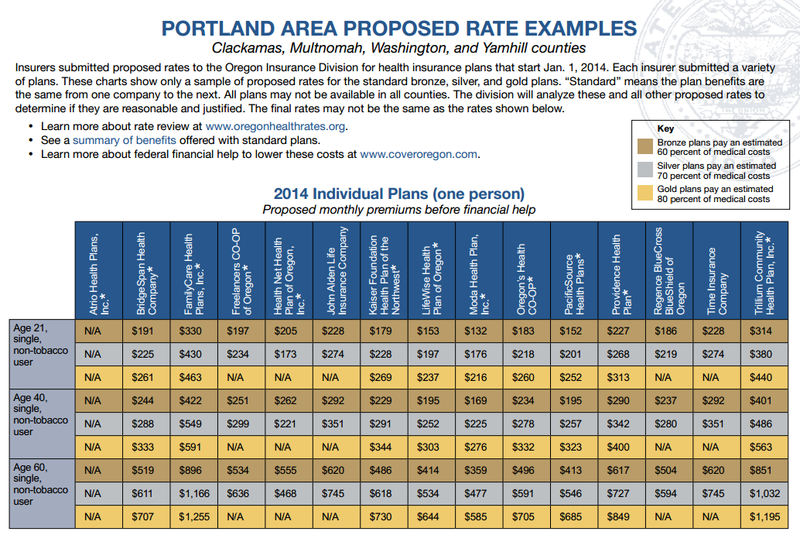 Oregon Health Insurance Exchange released proposed rates for coverage starting 2014. The Oregon Health Insurance Exchange, Cover Oregon, will be Oregon’s marketplace where individuals and small businesses can shop for health insurance plans and receive access to ACA tax credits and subsidies. How much will health plans cost for individuals, families, and small businesses through the Oregon Health Insurance Exchange? 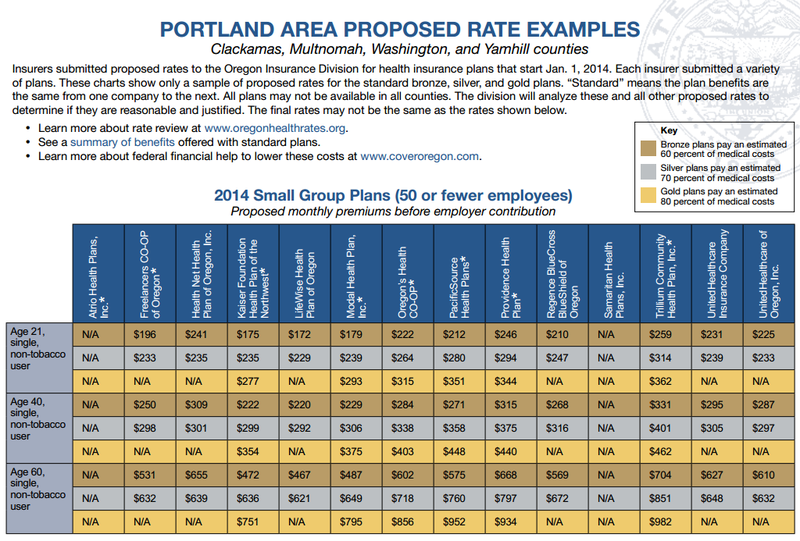 The Oregon Insurance Division and Department of Consumer and Business Services (DCBS) recently released proposed health plan rates for Oregon individuals, families, and small businesses. The Oregon Health Insurance Exchange will open October 1, 2013, for coverage starting January 1, 2014. According to the DCBS, thousands of Oregon residents are expected to purchase personal insurance policies using federal financial help (tax subsidies) through the Oregon Health Insurance Exchange. The Oregon Health Insurance Exchange intends to provide consumers with more choices, especially for individuals with pre-existing conditions, as federal law makes all policies guaranteed-issue. Oregon currently has a highly-competitive health insurance market, which will be reflected in the Oregon Health Insurance Exchange’s offerings. Along with 16 insurers, two (2) Consumer Operated and Oriented Plans (CO-OPS) filed plans and proposed rates with the Oregon Insurance Division. All plans still require approval by the Oregon Insurance Division. Carriers and rates will be finalized by July 2013. Proposed carriers in the Portland area for individual plans include FamilyCare Health Plans, Freelancers Co-Op of Oregon, Health Net Health Plan of Oregon, John Alden Life Insurance Company, Kaiser Foundation Health Plan of the NW, LifeWise Health Plan of Oregon, Moda Health Plan, Oregon’s Health Co-Op, PacificSource Health Plans, Providence Health Plan, Regence BlueCross BlueShield of Oregon, Time Insurance Company, and Trillium Community Health Plan. Click here to read DCBS news release.